How people communicate has changed a lot over past 50,000 years or so. When we dropped down from the trees we were grunting, we then began walking, and then talking. Once we got pretty good at talking someone invented writing, and ever since then we’ve been writing more and more, and talking less and less. Not all that change has been for the better, however. They say 55% of communication is body language, 38% is tone, and only the last 7% is the words you’re speaking. As we've changed how we communicate from grunting to talking to writing, our methods of communication haven’t always been able to keep up with our demands for communicating. With each new method of communicating a lot of what we're trying to say is lost. Spoken word makes it easy to communicate the tone, body language, and words. However unless you have a super memory it’s hard to manage all these spoken words, not to mention it's hard organise them in your head and hard to get them out there. Written word unfortunately has the opposite problems. It’s not all that expressive, but it is easy to retrieve and organise thoughts with it, and with modern technology it's super easy to get it out there. We’ve been moving to a more word based society for decades now, and along the way we’ve been losing the tone, the expressiveness, the colour from our communication. Some would say it's ironic. We emerged from the dark ages to invent the printing press, transforming the world forever, only to move into the grey ages where we communicated in written word, without expression. These grey ages (as we're calling them) lasted from roughly the invention of the printing press to just very recently. But now, after centuries of living in a world of blandly-written-word, just like Dorothy stepping into the Land of Oz we too are finally emerging into a full technicolor society. One where the written world is easy to refer to, easy to retrieve, and has the same expressive tone as speaking to someone face to face. Our grand saviour is of course, the humble Emoji 😊. First invented in Japan in 1999 to satiate demand for human-like expressiveness in written messaging, in recent years it’s spread further and further abroad, transforming every corner of the earth it touches into a veritable rainbow of colour and expression. 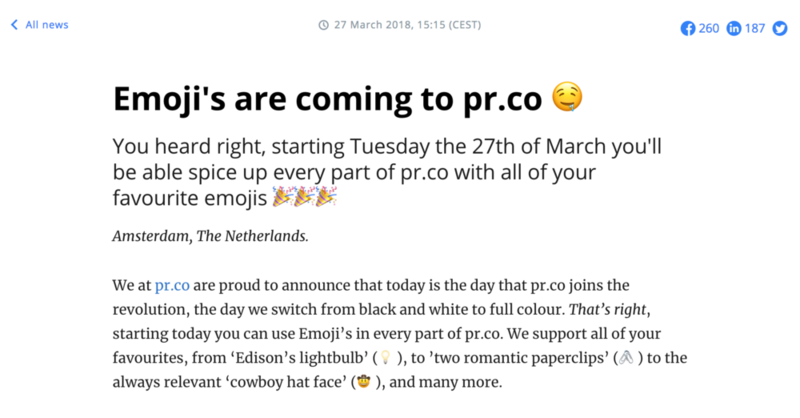 We at pr.co are proud to announce that today is the day that pr.co joins the revolution, the day we switch from black and white to full colour. 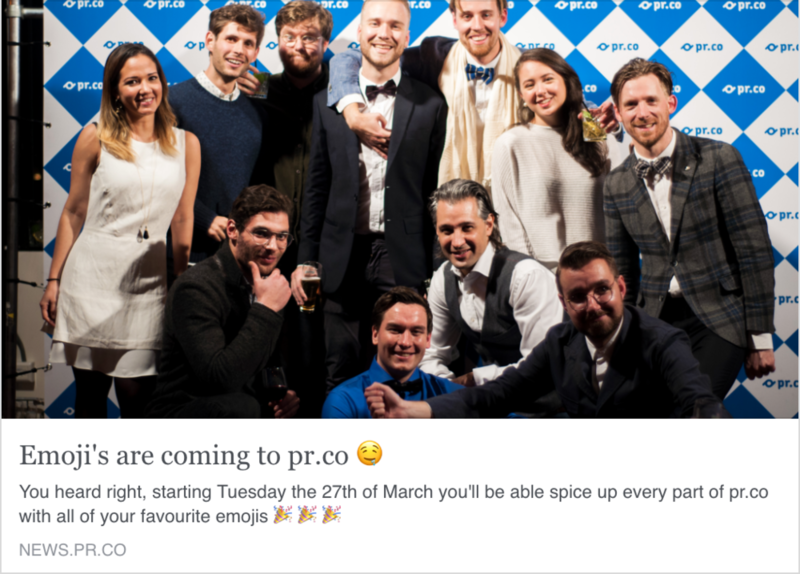 That’s right, starting today you can use Emoji’s in every part of pr.co. We support all of your favourites, from ‘Edison’s lightbulb’ (💡), to ’two romantic paperclips’ (🖇️) to the always relevant ‘cowboy hat face’ (🤠), and many more. You can now bring your press releases to life with the tone and expression that you’d use when talking to someone face to face. Tailor the emails you send out to your contacts by using their favourite emojis, embed videos with emojis in their titles, and anything more you can think of. This update is even bigger if you’re using Collaborate. 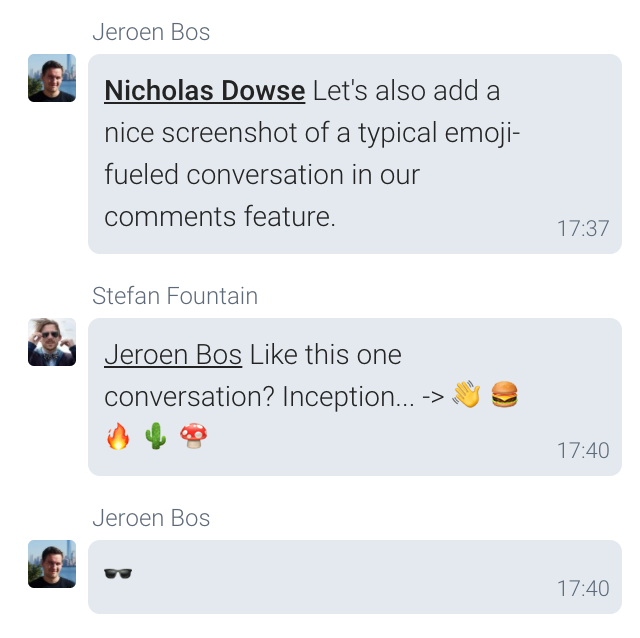 You can splash emoji’s through your messages with your colleagues and bring your comments to life, the way the emoji gods intended them to be. Can't wait to see you what you make from it!